When clients call us to book their maternity portrait session, they always ask: What do I need to do to prepare for the maternity portrait session? You should schedule your maternity portrait to occur sometime between weeks 32-36 if you are expecting one child, and between weeks 28-32 if you are expecting multiples. The best time of day to schedule is 10-11am or 1pm. You want to still look fresh, alert and not too tired. If you are working, some moms prefer to have their pregnancy photos in the morning and then schedule a doctor’s check up visit for the afternoon or just go into the office in the afternoon time. We have wifi in our studio so you can always work remote or login periodically if you need to. You are taking the time to have your maternity portraits taken by a professional photographer, so you want to look your best right? Go ahead and schedule your hair and makeup to be professional done as well. Remember to also have your nails and toes pampered too! You can always schedule your mani the day before to maximize your time before your maternity session. Your nails will show during your session. Remember to wear a loose fitting dress or button front top when having your make up and hair done. You will change your clothes at the studio before your session and you do not want to risk messing up your hair or makeup. Spoiler alert: you will look and feel amazing after your glam quad session before your portrait. Remember to schedule a date night with your husband and enjoy your night on the town! In the 8-9 months of your pregnancy sleep patterns will change. As your portrait approaches, remember to take it easy and get plenty of rest. You also want to make sure you are staying hydrated in the days leading up to your session. Drink plenty of water! Depending upon your session time, make sure you eat a full breakfast or lunch and remember to have snacks before and during your portrait session. We do have small snacks and plenty of water for you during your session. You are welcome to bring your own clothes for your pregnancy portraits. Most ladies opt to wear the pregnancy gowns we have in our prop closet. We have a variety of styles and colors to choose from. The gowns can easily be pinned and loosened as needed to fit you comfortably during your session. Pregnancy is a milestone time in a woman’s life and a portrait is a wonderful way to always remember this time. As your baby grows they will love looking at your pregnancy portraits. 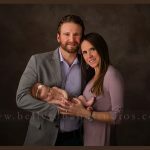 You can view more of our newborn portfolio here, Maternity Portraits and our Family Portraits here. Our studio is conveniently located in the Galleria area, in a professional office building. We have a private nursing lounge so you can relax and feed your baby between sets.